here is a great beginner arduino + neopixel "art hack" - you can bring any art form into life with this very simple instructable. I decided to create the christmas light wall decoration from the netflix show "stranger things"
it has an onboard usb rechargable battery, so you can hang it up anywhere and still be able to demonstrate your art.!! included zip file includes the 2D vector drawings. and how I alligned the lights on the board, to figure out exact drilling spots. i used adobe illustrator to design..
print the PDF file, which includes the picture to print and glue on the board. use US letter size paper and do not choose "fit to page" on print settings. follow the diagram and take your time, especially if you are new to soldering. you can use hot glue to first lay down the wire and secure it into place. here is the full circuit. you can recharge the battery like a cell phone. and then use the usb cable to power the arduino either from the battery or from any usb outlet. button opposite leg goes to D4 on arduino. before gluing anything, place the print on the board to see if everything is aligned right. if you hold it up to ambient light, you should see it come through the paper. i used cardstock paper to make it more durable & spray glue to secure it down on the wooden board. please share, favorite + follow.!! What is the Z light connected to? On the plans it just has the 5V data and GND in, but on your actual project it connects to the board. Thank you everyone for their fantastic advice and guidance on this project. 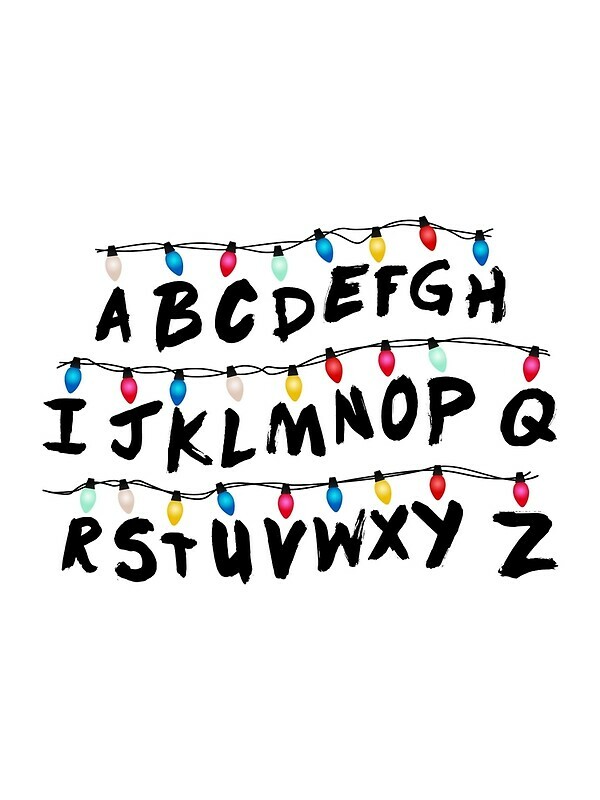 I've made a vector version of the text - it's not exactly the font for the letters, but the bulbs are in the same place, so it will work with this layout for the LEDs. weird, uno is ok to use, same thing. did you install the neopixel library correctly.? also are you powering the lights correctly.? edit it possibly for bigger printing. How did you make it originally? I also noticed it was pixelated in areas which would look even worse when blown up. Any suggestions? My LEDs came in, and I've been able to start testing. The C9 format is exactly what I wanted, and they are working great. They are 12V, so I did need to run additional power independantly (I may ask you some additional hardware questions later)! For the code, here's a quick clean up of what you provided. The "For" loop is useful if you want to set all LEDs to the same colour (or turn them all off). It isn't necessary for turning individual lights on and off. Hopefully you can make sense of what I've done, and re-do your code snippets in the instructable. In another week or so, I'll share the updated code I'm doing, so the lights will blink, and do patterns, and hopefully have a simplified way of entering messages. // used so that the color of each LED stays the same. // Values are generated in setup(). // simply show black instead of clearing the array. // after the flicker. Could be replaced with a delay() in setup(). I really need to find the time to try this. So cool! Thanks for posting this! I had the same idea as you and am happy there are others posting code here as that's my next step. I used neopixels and a Circuit Playground from Adafruit. I'm also working on setting up a character array that will be read from, instead of a long line of code. Mine is going to be a Halloween costume so I am putting it on cardboard and wearing. You can also sew them into a shirt! I got some tiny dollhouse/scrapbooking Holiday lights. I will post some updates this weekend and share my code once I get it going. very good stuff, hope you got to rock it for halloween.!! Hey guys so I'm actually building this for an Art Project, and I really want to do this. However I'm completely new to coding and where to get them materials at. Anyone know a spot where I can find them without buying online since I have till Oct31 to present? sorry for the late response, instructables didn't email me about this comment..
how did it go, did you present.?! Also, this time of year places like Hobby Lobby or craft stores will have small plastic holiday lights that can be used for scrapbooking and wrapping gifts. That way you don't have to buy actual lights and can save some money. If you go to https://www.adafruit.com/distributors, you can see if there is a local store you can get them from. Microcenter in the US has neopixels, and various controllers you can use; if you live near one with a stock you don't have to wait for shipping. And for learning code, I would just use the code others have posted to get it working, and learn from how it works. Basic principle of coding for me is: Take an input and do stuff to get your required output. I'm still learning myself, but it helps to think of it that way to read code and figure out what is being done to the input. This is great project to learn from! I'm having the hardest time getting the solder to stick when it does its super fragile and breaks off of the LEDs. Are there any tricks to getting it to be secure? I was completely new to soldering with this project. I bought the smallest tip I could find at Radio Shack, and the smallest diameter solder. I touched the tip to each LED and then the solder to form a very small puddle of solder. Then I came back with the wire, reheated the solder and quickly placed the wire down into it. Seemed to work for me.